“Quizás quiso decir Júpiter” (Maybe You want to say Jupiter), looking into the 90’s. JAPIWOR is Angel Donoso (October 17th 1977), own project, a musician from Ciudad Real (Spain) with some years of experience in different previous bands. After which it decided take a rest during a year by private reasons, and to make JAPIWOR - "happy world" in your own language - in 2004, a project that is born with the own purity of that does not have the dutty to please the music bussines, only to create music with absolute freedom. 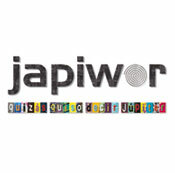 Since then it has published 3 CD’s, that compile different songs from their old bands, under the brand JAPIWOR. Ángel Japiwor is not closed to anything, and he is declared fan of Faemino y Cansado, Muchachada Nui and Woody Allen, but their songs have the roots in the music of their generation, in the sounds of 90's. In their music echoes of bands like Soundgarden, Alice in Chains or Smashing Pumpkins, decorated with elements of funk-rock of low intensity and I touch electronics minimalism. Moments where music moves smoothly as reptile later to explode in melancholic fits and of harmonia. Frank Zappa also is a musician to whom he admires, and can prove it the eclectic roots of this new disc. Yes, it drinks of his generation but it has musical culture and that it note. At lyrics level, JAPIWOR uses lyrics with elements of sci fi, titles like "Rebelion Autómata" (first hit single), "Antimateria" or "Abismo Punto Cero", with a marked influence of the band Lagartija Nick from Granada (Spain). Perhaps its 4th CD, published by Flor y Nata Records, "Quizás quiso decir Júpiter" has counted with musicians of quality from Ciudad Real, and the plays himsels almost all and sings. A work that consolidates it within the panorama of the rock sung in Spanish. And it is that there are not many proposals like hers. It is the moment for saying Jupiter and, JAPIWOR first of all. The trip is assured.